For other uses, see Caterpillar (disambiguation). As with most common names, the application of the word is arbitrary and the larvae of sawflies commonly are called caterpillars as well. Both lepidopteran and symphytan larvae have eruciform body shapes. Caterpillars of most species are herbivorous (folivorous), but not all; some (about 1%) are insectivorous, even cannibalistic. Some feed on other animal products; for example clothes moths feed on wool, and horn moths feed on the hooves and horns of dead ungulates. Caterpillars are typically voracious feeders and many of them are among the most serious of agricultural pests. In fact many moth species are best known in their caterpillar stages because of the damage they cause to fruits and other agricultural produce, whereas the moths are obscure and do no direct harm. Conversely, various species of caterpillar are valued as sources of silk, as human or animal food, or for biological control of pest plants. The origins of the word "caterpillar" date from the early 16th century. They derive from Middle English catirpel, catirpeller, probably an alteration of Old North French catepelose: cate, cat (from Latin cattus) + pelose, hairy (from Latin pilōsus). 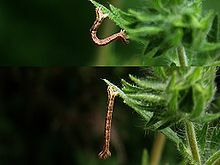 The inchworm, or looper caterpillars from the family Geometridae are so named because of the way they move, appearing to measure the earth (the word geometrid means earth-measurer in Greek); the primary reason for this unusual locomotion is the elimination of nearly all the prolegs except the clasper on the terminal segment. Larvae of Craesus septentrionalis, a sawfly showing 6 pairs of pro-legs. Caterpillars have soft bodies that can grow rapidly between moults. 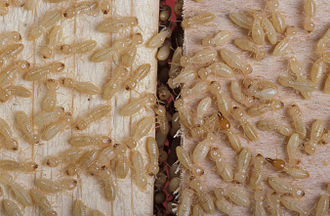 Their size varies between species and instars (moults) from as small as 1 mm up to 14 cm. Some larvae of the order Hymenoptera (ants, bees and wasps) can appear like the caterpillars of the Lepidoptera. 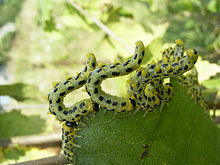 Such larvae are mainly seen in the sawfly suborder. However while these larvae superficially resemble caterpillars, they can be distinguished by the presence of prolegs on every abdominal segment, an absence of crochets or hooks on the prolegs (these are present on lepidopteran caterpillars), one pair of prominent ocelli on the head capsule, and an absence of the upside-down Y-shaped suture on the front of the head. 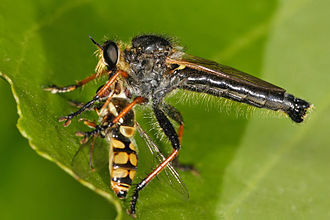 the numbers of pairs of pro-legs; sawfly larvae have 6 or more pairs while caterpillars have a maximum of 5 pairs. the number of stemmata (simple eyes); the sawfly larvae have only two, while caterpillars usually have six. the presence of crochets on the prolegs; these are absent in the sawflies. sawfly larvae have an invariably smooth head capsule with no cleavage lines, while lepidopterous caterpillars bear an inverted "Y" or "V" (adfrontal suture). The saddleback caterpillar has urticating hair and aposematic colouring. Many animals feed on caterpillars as they are rich in protein. As a result, caterpillars have evolved various means of defense. Caterpillars have evolved defenses against physical conditions such as cold, hot or dry environmental conditions. Some Arctic species like Gynaephora groenlandica have special basking and aggregation behaviours apart from physiological adaptations to remain in a dormant state. The appearance of a caterpillar can often repel a predator: its markings and certain body parts can make it seem poisonous, or bigger in size and thus threatening, or non-edible. Some types of caterpillars are indeed poisonous or distasteful and their bright coloring is aposematic. Others may mimic dangerous caterpillars or other animals while not being dangerous themselves. Many caterpillars are cryptically colored and resemble the plants on which they feed. An example of caterpillars that use camouflage for defence is the species Nemoria arizonaria. If the caterpillars hatch in the spring and feed on oak catkins they appear green. If they hatch in the summer they appear dark colored, like oak twigs. The differential development is linked to the tannin content in the diet. Caterpillars may even have spines or growths that resemble plant parts such as thorns. Some look like objects in the environment such as bird droppings. More aggressive self-defense measures are taken by some caterpillars. These measures include having spiny bristles or long fine hair-like setae with detachable tips that will irritate by lodging in the skin or mucous membranes. However some birds (such as cuckoos) will swallow even the hairiest of caterpillars. Other caterpillars acquire toxins from their host plants that render them unpalatable to most of their predators. For instance, ornate moth caterpillars utilize pyrrolizidine alkaloids that they obtain from their food plants to deter predators. The most aggressive caterpillar defenses are bristles associated with venom glands. These bristles are called urticating hairs. A venom which is among the most potent defensive chemicals in any animal is produced by the South American silk moth genus Lonomia. Its venom is an anticoagulant powerful enough to cause a human to hemorrhage to death (See Lonomiasis). This chemical is being investigated for potential medical applications. Most urticating hairs range in effect from mild irritation to dermatitis. Example: Brown-tail moth. 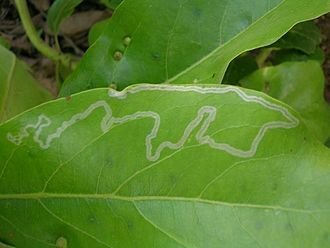 Plants contain toxins which protect them from herbivores, but some caterpillars have evolved countermeasures which enable them to eat the leaves of such toxic plants. In addition to being unaffected by the poison, the caterpillars sequester it in their body, making them highly toxic to predators. The chemicals are also carried on into the adult stages. These toxic species, such as the cinnabar moth (Tyria jacobaeae) and monarch (Danaus plexippus) caterpillars, usually advertise themselves with the danger colors of red, yellow and black, often in bright stripes (see aposematism). Any predator that attempts to eat a caterpillar with an aggressive defense mechanism will learn and avoid future attempts. Caterpillars linked together into a "train"
Many caterpillars display feeding behaviors which allow the caterpillar to remain hidden from potential predators. Many feed in protected environments, such as enclosed inside silk galleries, rolled leaves or by mining between the leaf surfaces. Some caterpillars, like early instars of the tomato hornworm and tobacco hornworm, have long "whip-like" organs attached to the ends of their body. The caterpillar wiggles these organs to frighten away flies and predatory wasps. Some caterpillars can evade predators by using a silk line and dropping off from branches when disturbed. Many species thrash about violently when disturbed to scare away potential predators. One species (Amorpha juglandis) even makes high pitched whistles that can scare away birds. Some caterpillars obtain protection by associating themselves with ants. The Lycaenid butterflies are particularly well known for this. They communicate with their ant protectors by vibrations as well as chemical means and typically provide food rewards. Some caterpillars are gregarious; large aggregations are believed to help in reducing the levels of parasitization and predation. Clusters amplify the signal of aposematic coloration, and individuals may participate in group regurgitation or displays. Pine processionary (Thaumetopoea pityocampa) caterpillars often link into a long train to move through trees and over the ground. 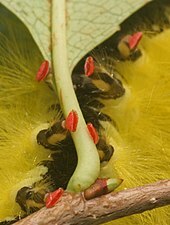 The head of the lead caterpillar is visible, but the other heads can appear hidden. Forest tent caterpillars cluster during periods of cold weather. Caterpillars suffer predation from many animals. The European pied flycatcher is one species that preys upon caterpillars. The flycatcher typically finds caterpillars among oak foliage. Paper wasps, including those in the genus Polistes and Polybia catch caterpillars to feed their young and themselves. Caterpillars have been called "eating machines", and eat leaves voraciously. Most species shed their skin four or five times as their bodies grow, and they eventually enter a pupal stage before becoming adults. Caterpillars grow very quickly; for instance, a tobacco hornworm will increase its weight ten-thousandfold in less than twenty days. An adaptation that enables them to eat so much is a mechanism in a specialized midgut that quickly transports ions to the lumen (midgut cavity), to keep the potassium level higher in the midgut cavity than in the hemolymph. Most caterpillars are solely herbivorous. 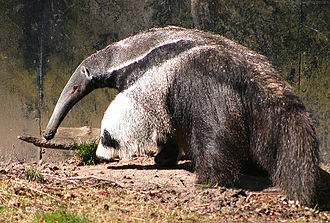 Many are restricted to feeding on one species of plant, while others are polyphagous. Some, including the clothes moth, feed on detritus. Some are predatory, and may prey on other species of caterpillars (e.g. Hawaiian Eupithecia). Others feed on eggs of other insects, aphids, scale insects, or ant larvae. A few are parasitic on cicadas or leaf hoppers (Epipyropidae). Some Hawaiian caterpillars (Hyposmocoma molluscivora) use silk traps to capture snails. Many caterpillars are nocturnal. 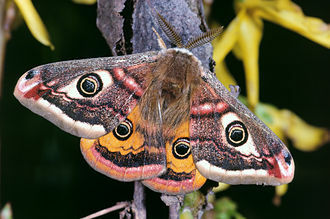 For example, the "cutworms" (of the family Noctuidae) hide at the base of plants during the day and only feed at night. Others, such as gypsy moth (Lymantria dispar) larvae, change their activity patterns depending on density and larval stage, with more diurnal feeding in early instars and high densities. Caterpillars cause much damage, mainly by eating leaves. The propensity for damage is enhanced by monocultural farming practices, especially where the caterpillar is specifically adapted to the host plant under cultivation. The cotton bollworm causes enormous losses. Other species eat food crops. Caterpillars have been the target of pest control through the use of pesticides, biological control and agronomic practices. Many species have become resistant to pesticides. Bacterial toxins such as those from Bacillus thuringiensis which are evolved to affect the gut of Lepidoptera have been used in sprays of bacterial spores, toxin extracts and also by incorporating genes to produce them within the host plants. These approaches are defeated over time by the evolution of resistance mechanisms in the insects. Plants evolve mechanisms of resistance to being eaten by caterpillars, including the evolution of chemical toxins and physical barriers such as hairs. Incorporating host plant resistance (HPR) through plant breeding is another approach used in reducing the impact of caterpillars on crop plants. Some caterpillars are used in industry. The silk industry is based on the silkworm caterpillar. 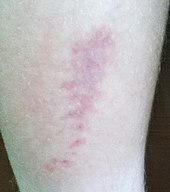 Buck moth caterpillar sting on a shin twenty-four hours after occurrence in south Louisiana. The reddish mark covers an area about 20 mm at its widest point by about 70 mm in length. Caterpillar hair can be a cause of human health problems. Caterpillar hairs sometimes have venoms in them and species from approximately 12 families of moths or butterflies worldwide can inflict serious human injuries ranging from urticarial dermatitis and atopic asthma to osteochondritis, consumption coagulopathy, renal failure, and intracerebral hemorrhage. Skin rashes are the most common, but there have been fatalities. Lonomia is a frequent cause of envenomation in Brazil, with 354 cases reported between 1989 and 2005. Lethality ranging up to 20% with death caused most often by intracranial hemorrhage. Caterpillar hair has also been known to cause kerato-conjunctivitis. The sharp barbs on the end of caterpillar hairs can get lodged in soft tissues and mucous membranes such as the eyes. Once they enter such tissues, they can be difficult to extract, often exacerbating the problem as they migrate across the membrane. This becomes a particular problem in an indoor setting. The hair easily enter buildings through ventilation systems and accumulate in indoor environments because of their small size, which makes it difficult for them to be vented out. This accumulation increases the risk of human contact in indoor environments. Caterpillars are a food source in some cultures. For example, in South Africa mopane worms are eaten by the bushmen, and in China silkworms are considered a delicacy. Wikimedia Commons has media related to Caterpillars in art. 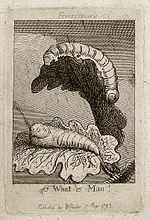 William Blake's illustration of a caterpillar overlooking a child from his illustrated book For Children The Gates of Paradise. In the Old Testament of the Bible caterpillars are feared as pest that devour crops. They are part of the "pestilence, blasting, mildew, locus" because of their association with the locust, thus they are one of the plagues of Egypt. Jeremiah names them as one of the inhabitants of Babylon. The English word caterpillar derives from the old French catepelose (hairy cat) but merged with the piller (pillager). Caterpillars became a symbol for social dependents. Shakespeare's Bolingbroke described King Richard's friends as "The caterpillars of the commonwealth, Which I have sworn to weed and pluck away". In 1790 William Blake referenced this popular image in The Marriage of Heaven and Hell when he attacked priests: "as the caterpillar chooses the fairest leaves to lay her eggs on, so the priest lay his curse on the fairest joys". The role of caterpillars in the life stages of butterflies was badly understood. In 1679 Maria Sibylla Merian published the first volume of The Caterpillars' Marvelous Transformation and Strange Floral Food, which contained 50 illustrations and a description of insects, moths, butterflies and their larvae. An earlier popular publication on moths and butterflies, and their caterpillars, by Jan Goedart had not included eggs in the life stages of European moths and butterflies, because he had believed that caterpillars were generated from water. When Merian published her study of caterpillars it was still widely believed that insects were spontaneously generated. Merian's illustrations supported the findings of Francesco Redi, Marcello Malpighi and Jan Swammerdam. Butterflies were regarded as symbol for the human soul since ancient time, and also in the Christian tradition. Goedart thus located his empirical observations on the transformation of caterpillars into butterflies in the Christian tradition. As such he argued that the metamorphosis from caterpillar into butterfly was a symbol, and even proof, of Christ's resurrection. He argued "that from dead caterpillars emerge living animals; so it is equally true and miraculous, that our dead and rotten corpses will rise from the grave." Swammerdam, who in 1669 had demonstrated that inside a caterpillar the rudiments of the future butterfly's limbs and wings could be discerned, attacked the mystical and religious notion that the caterpillar died and the butterfly subsequently resurrected. As a militant Cartesian, Swammerdam attacked Goedart as ridiculous, and when publishing his findings he proclaimed "here we witness the digression of those who have tried to prove Resurrection of the Dead from these obviously natural and comprehensible changes within the creature itself." Since then the metamorphoses of the caterpillar into a butterfly has in Western societies been associated with countless human transformations in folktales and literature. There is no process in the physical life of human beings that resembles this metamorphoses, and the symbol of the caterpillar tends to depict a psychic transformation of a human. As such the caterpillar has in the Christian tradition become a metaphor for being "born again". 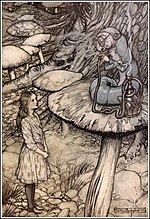 Famously, in Lewis Carroll's Alice's Adventures in Wonderland a caterpillar asks Alice "Who are you?". When Alice comments on the caterpillar's inevitable transformation into a butterfly, the caterpillar champions the position that in spite of changes it is still possible to know something, and that Alice is the same Alice at the beginning and end of a considerable interval. When the Caterpillar asks Alice to clarify a point, the child replies "I'm afraid I can't put it more clearly... for I can't but understand it myself, to begin with, and being so many different sizes in a day is very confusing". Here Carroll satirizes René Descartes, the founder of Cartesian philosophy, and his theory on innate ideas. Descartes argued that we are distracted by urgent bodily stimuli that swamp the human mind in childhood. Descartes also theorised that inherited preconceived opinions obstruct the human perception of the truth. More recent symbolic references to caterpillars in popular media include the Mad Men season 3 episode "The Fog", in which Betty Draper has a drug-induced dream, while in labor, that she captures a caterpillar and holds it firmly in her hand. In The Sopranos season 5 episode "The Test Dream", Tony Soprano dreams that Ralph Cifaretto has a caterpillar on his bald head that changes into a butterfly. Click left or right for a slide show. Caterpillar of the spurge hawk-moth, near Binn, Valais, Switzerland at c. 2 km altitude. Caterpillar of the emperor gum moth. A poplar hawk-moth caterpillar (a common species of caterpillar in the UK). Ant tending a lycaenid caterpillar. Life cycle of the red-humped caterpillar (Schizura concinna ). Locomotion of a small Geometrid caterpillar. ^ Eleanor Anne Ormerod (1892). A text-book of agricultural entomology: being a guide to methods of insect life and means of prevention of insect ravage for the use of agriculturists and agricultural students. Simpkin, Marshall, Hamilton, Kent & Co.
^ Roger Fabian Anderson (January 1960). Forest and Shade Tree Entomology. Wiley. ISBN 978-0-471-02739-3. ^ "Caterpillar". Dictionary.com. The American Heritage Dictionary of the English Language, Fourth Edition. Houghton Mifflin Company, 2004. (accessed: March 26, 2008). ^ "Geometridae." Merriam-Webster.com. Merriam-Webster, n.d. Web. 19 September 2017. ^ Hall, Donald W. (September 2014). "Featured Creatures: hickory horned devil, Citheronia regalis". University of Florida, Entomology and Nematology Department. Retrieved 19 September 2017. ^ Meyer-Rochow, Victor Benno (1974). "Structure and function of the larval eye of the sawfly Perga". Journal of Insect Physiology. 20 (8): 1565–1591. doi:10.1016/0022-1910(74)90087-0. ^ Kukal, O.; B. Heinrich & J. G. Duman (1988). "Behavioral thermoregulation in the freeze-tolerant arctic caterpillar, Gynaeophora groenlandica". J. Exp. Biol. 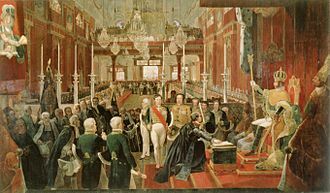 138 (1): 181–193. ^ Greene, E (1989). "A Diet-Induced Developmental Polymorphism in a Caterpillar" (PDF). Science. 243 (4891): 643–646. Bibcode:1989Sci...243..643G. CiteSeerX 10.1.1.462.1931. doi:10.1126/science.243.4891.643. 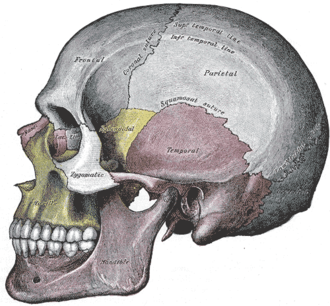 PMID 17834231. ^ Dussourd, D. E. "Biparental Defensive Endowment of Eggs with Acquired Plant Alkaloid in the Moth Utetheisa Ornatrix." Proceedings of the National Academy of Sciences 85.16 (1988): 5992-996. Print. ^ Darby, Gene (1958). What is a Butterfly. Chicago: Benefic Press. p. 13. ^ Bura, V. L.; Rohwer, V. G.; Martin, P. R.; Yack, J. E. (2010). "Whistling in caterpillars (Amorpha juglandis, Bombycoidea): Sound-producing mechanism and function". Journal of Experimental Biology. 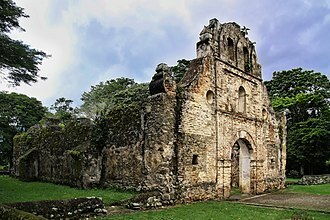 214 (Pt 1): 30–37. doi:10.1242/jeb.046805. PMID 21147966. ^ Lycaenid butterflies and ants. Australian museum (2009-10-14). Retrieved on 2012-08-14. ^ Terrence Fitzgerald. "Pine Processionary Caterpillar". Web.cortland.edu. Retrieved 2013-05-08. ^ Monarch Butterfly. Scienceprojectlab.com. Retrieved on 2012-08-14. ^ Chamberlin, M.E. ; M.E. King (1998). "Changes in midgut active ion transport and metabolism during the fifth instar of the tobacco hornworm (Manduca sexta)". J. Exp. Zool. 280 (2): 135–141. doi:10.1002/(SICI)1097-010X(19980201)280:2<135::AID-JEZ4>3.0.CO;2-P.
^ Pierce, N.E. (1995). "Predatory and parasitic Lepidoptera: Carnivores living on plants" (PDF). Journal of the Lepidopterists' Society. 49 (4): 412–453. ^ Rubinoff, Daniel; Haines, William P. (2005). "Web-spinning caterpillar stalks snails". Science. 309 (5734): 575. doi:10.1126/science.1110397. PMID 16040699. ^ "Caterpillars of Pacific Northwest Forests and Woodlands". USGS. ^ Lance, D. R.; Elkinton, J. S.; Schwalbe, C. P. (1987). "Behaviour of late-instar gypsy moth larvae in high and low density populations". Ecological Entomology. 12 (3): 267. doi:10.1111/j.1365-2311.1987.tb01005.x. ^ Tent Caterpillars and Gypsy Moths. Dec.ny.gov. Retrieved on 2012-08-14. ^ van Emden; H. F. (1999). "Transgenic Host Plant Resistance to Insects—Some Reservations". Annals of the Entomological Society of America. 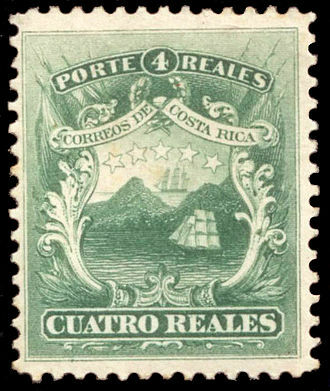 92 (6): 788–797. doi:10.1093/aesa/92.6.788. ^ Diaz, HJ (2005). "The evolving global epidemiology, syndromic classification, management, and prevention of caterpillar envenoming". Am. J. Trop. Med. Hyg. 72 (3): 347–357. doi:10.4269/ajtmh.2005.72.347. PMID 15772333. ^ Redd, JT; Voorhees, RE; Török, TJ (2007). "Outbreak of lepidopterism at a Boy Scout camp". Journal of the American Academy of Dermatology. 56 (6): 952–955. doi:10.1016/j.jaad.2006.06.002. PMID 17368636. 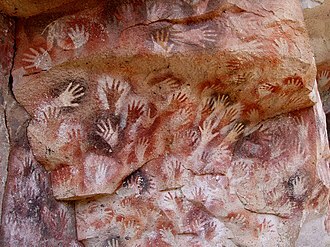 ^ Kowacs, PA; Cardoso, J; Entres, M; Novak, EM; Werneck, LC (December 2006). "Fatal intracerebral hemorrhage secondary to Lonomia obliqua caterpillar envenoming: case report". Arquivos de Neuro-Psiquiatria. 64 (4): 1030–2. doi:10.1590/S0004-282X2006000600029. PMID 17221019. ^ Patel RJ, Shanbhag RM (1973). "Ophthalmia nodosa – (a case report)". Indian J Ophthalmol. 21 (4): 208. ^ Balit, C. R.; Ptolemy, H. C.; Geary, M. J.; Russell, R. C.; Isbister, G. K. (2001). "Outbreak of caterpillar dermatitis caused by airborne hairs of the mistletoe browntail moth (Euproctis edwardsi)". The Medical Journal of Australia. 175 (11–12): 641–3. ISSN 0025-729X. PMID 11837874. ^ Michael Ferber (2017). A Dictionary of Literary Symbols. Cambridge University Press. ISBN 9781316780978. ^ Boria Sax (1998). The Serpent and the Swan: The Animal Bride in Folklore and Literature. Univ. of Tennessee Press. p. 70. ISBN 9780939923687. ^ Boria Sax (1998). The Serpent and the Swan: The Animal Bride in Folklore and Literature. Univ. of Tennessee Press. p. 71. ISBN 9780939923687. ^ Sherry Ackerman (2009). Behind the Looking Glass. Cambridge Scholars Publishing. p. 103. ISBN 9781443804561. ^ Sherry Ackerman (2009). Behind the Looking Glass. Cambridge Scholars Publishing. p. 99. ISBN 9781443804561. ^ What's Alan Watching? : Mad Men, "The Fog"
In ecology, crypsis is the ability of an animal to avoid observation or detection by other animals. It may be a strategy or an antipredator adaptation. Methods include camouflage, subterranean lifestyle, and mimicry, crypsis can involve visual, olfactory, or auditory concealment. 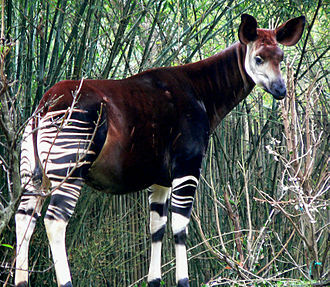 When it is visual, the cryptic coloration, effectively a synonym for animal camouflage, is sometimes used. Cryptic animals include the tawny frogmouth, the tuatara, some jellyfish, the sea dragon. 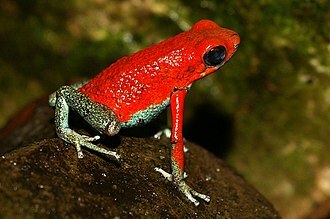 Methods of crypsis include camouflage and subterranean lifestyle, camouflage involves a variety of methods, from disruptive coloration to transparency and some forms of mimicry. As a strategy, crypsis is used by predators against prey, crypsis applies to eggs and pheromone production. Crypsis can in principle involve visual, olfactory, or auditory camouflage, such animals may resemble rocks, twigs and even bird droppings. Countershading, the use of different colors on upper and lower surfaces in graduating tones from a belly to a darker back, is common in the sea. Where the background is brighter than is possible even with white pigment, counter-illumination in marine animals, such as squid, some animals actively camouflage themselves with local materials. The decorator crabs attach plants, small stones, or shell fragments to their carapaces to provide camouflage that matches the local environment, some species preferentially select stinging animals such as sea anemones or noxious plants, benefiting from aposematism as well as or instead of crypsis. Some animals, in terrestrial and aquatic environments, appear to camouflage their odor, which might otherwise attract predators. Numerous arthropods, both insects and spiders, mimic ants, whether to avoid predation, to hunt ants, pirate perch may exhibit chemical crypsis, making them undetectable to frogs and insects colonizing ponds. In the latter type of moth, detailed analyses failed to support a phantom echo mechanism underlying sonar jamming, different aspects of crypsis and sensory abilities may be more or less pronounced in given predator-prey species pairs. A simple eye refers to a type of eye form or optical arrangement that contains a single lens. A simple eye is so called in distinction from a compound eye. The eyes of humans and large animals, and camera lenses are classed as simple because in both cases a single lens collects and focuses light onto the retina or film. Many insects have compound eyes consisting of multiple lenses, each focusing light onto a number of retinula cells. The structure of an eye is determined by the environment in which it lives. Arthropods differ widely in the habitats in which live, as well as their visual requirements for finding food or conspecifics. Consequently, a variety of eye designs are found in arthropods. Some jellyfish, sea stars, and flatworms bear the simplest eyes, pigment spot ocelli, which have pigment distributed randomly, the apparent eye color in these animals is therefore red or black. However, other cnidaria have more complex eyes, including those of Cubomedusae which have distinct retina, many snails and slugs have ocelli, either at the tips or at the bases of the tentacles. However, some gastropods, such as the Strombidae, have much more sophisticated eyes. Giant clams have ocelli that allow light to penetrate their mantles, spiders do not have compound eyes, but instead have several pairs of simple eyes with each pair adapted for a specific task or tasks. The principal and secondary eyes in spiders are arranged in four or more pairs, only the principal eyes have moveable retinas. The secondary eyes have a reflector at the back of the eyes, the light-sensitive part of the receptor cells is next to this, so they get direct and reflected light. In hunting or jumping spiders, for example, a forward-facing pair possesses the best resolution to see the prey at a large distance, night-hunting spiders eyes are very sensitive in low light levels with a large aperture, f/0.58. The term ocellus is derived from the Latin oculus, and literally means little eye, two distinct ocellus types exist, dorsal ocelli, found in most insects, and lateral ocelli, which are found in the larvae of some insect orders. Urtica is Latin for nettle, and hairs that urticate are characteristic of this type of plant, and many other plants in several families. This term refers to types of barbed hairs that cover the dorsal. Many tarantula species eject hairs from their abdomens, directing them toward potential attackers and these hairs can embed themselves in the other animals skin or eyes, causing physical irritation, usually to great discomfort. The most common form of urticating hairs in plants are typified by nettles, the points of these hairs usually break off in the wound, and the acrid fluid is pressed into it. Various plants unrelated to true nettles possess similar defensive hairs, several lepidopteran families include species whose larvae bear urticating hairs. Families prominent in this include the following. Adults of some species have urticating scales, and some species shed some of their hairs as defense for their pupae. The urticating setae or spines can cause irritation when they break off, in some species these structures are hollow and connected to poison-producing cells, functioning like a hypodermic needle. Generally most hairs are irritating, but some are dangerous to the eyes and respiratory tract. Certain species of Lonomia in the family Saturniidae actually can inject venom that is life-threatening to humans, the stings are not part of a deliberate attack, but are mainly the result of brushing against the spines. However, many species whose larvae are armed with such hairs have behavioral patterns adapted to present the urticating hairs as a defensive threat, for example, many larvae in the family Lasiocampidae bear dense bands of short stinging hairs across their thoracic segments. The hairs are normally retracted into a fold in the skin, but if the caterpillar is disturbed, it everts the folds and displays the hairs. If seriously stimulated or gripped, lasiocampid larvae are likely to lash about, toxins from the broken hairs may spill out, causing dermatitis on the surface of the skin. In spite of such defenses, some species of birds feed avidly on hairy caterpillars, examples of avian predators other than cuckoos that feed on hairy caterpillars include at least tens of species from several continents. Asclepias incarnata is a herbaceous perennial plant species native to North America. It grows in damp to wet soils and is cultivated as a plant for its flowers. Like most other milkweeds, it has sap containing toxic chemicals, swamp milkweed is an upright,100 to 150 cm tall plant, growing from thick, white roots. Typically, its stems are branched and the clump forming plants emerge in spring after most other plants have begun growth for the year. The oppositely arranged leaves are 7.5 to 15 cm long and 1 to 4 cm wide and are narrow and lance-shaped, the plants bloom in early to mid-summer, producing small, pink to mauve colored flowers in rounded umbels. The flower color may vary from shades of purple to soft, pinkish purple. The flowers have five reflexed petals and a central crown. After blooming, green seed pods, approximately 12 centimetres long, are produced that when ripe and they release light to dark brown, flat seeds that are attached to silver-white silky-hairs ideal for catching the wind. This natural mechanism for seed dispersal is similar to that used by other milkweed plants. Swamp milkweed prefers moisture retentive to damp soils in sun to partial shade and typically, is found growing wild near the edges of ponds, streams. 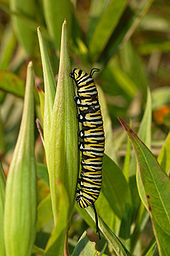 It is one of the best attractors of the monarch butterfly, the emerging caterpillars feed on the leaves. The plants have specialized roots for living in wet soils. The scented, white roots are adapted to live in low in oxygen. Blooming occurs in mid to late summer and after blooming long, relatively thin, the pods split open in late summer to late fall, releasing seeds that are attached to silky hairs, which act as parachutes that carry the seeds on the currents of the wind. This species is cultivated frequently and a number of cultivars are available and they are used especially in gardens designed to attract butterflies. The nectar of the plant attracts many species of butterflies. The plants are sold as freshly cut flowers, mostly for their long-lasting flower display. The family Saturniidae, commonly known as saturniids, by most measures include the largest species of moths. 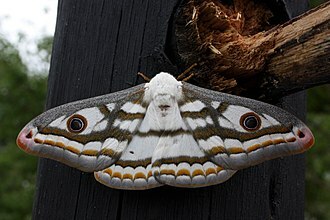 They are a family of Lepidoptera, with an estimated 2,300 described species worldwide, the Saturniidae include such Lepidoptera as the giant silkmoths, royal moths and emperor moths. Adults are characterized by size, heavy bodies covered in hair-like scales, lobed wings, reduced mouthparts. They lack a frenulum but the wings overlap the forewings. 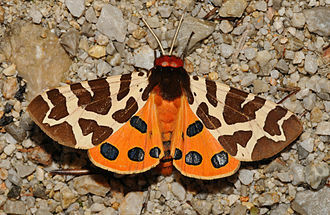 These moths are brightly colored and often have translucent eyespots or windows on their wings. Sexual dimorphism varies by species, but males can generally be distinguished by their larger, broader antennae, most adults possess wing spans between 1 and 6 in, but some tropical species, such as the Atlas moth, may have wing spans up to 12 in. Together with certain Noctuidae, the Saturniidae contain the largest Lepidoptera, the majority of saturniid species occur in wooded tropical or subtropical regions, with the greatest diversity in the New World tropics and Mexico, though they are found all over the world. Some saturniids are strictly univoltine, producing one generation a year, whereas others are multivoltine. 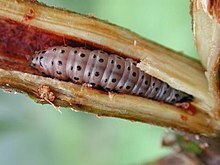 Spring and summer broods hatch in a matter of weeks, autumn broods enter a state known as diapause, longer days may prompt pupae to develop early, while shorter days result in pupal diapause. In some species – e. g. the luna moth or Callosamia securifera –, spring and summer broods look different, depending on the moth, a single female may lay up to 200 eggs on a chosen host plant. 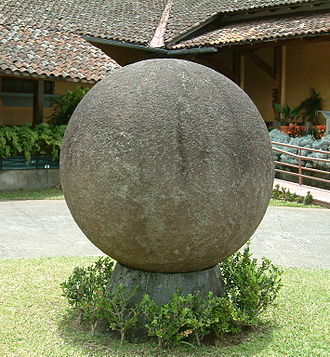 Others are laid singly or in small groups and they are round, slightly flattened and translucent or whitish. Saturniid caterpillars are large and cylindrical, most have tubercules that are often spiny or hairy. Many are cryptic in coloration, with countershading or disruptive coloration to reduce detection, a few species have been noted to produce clicking sounds with the larval mandibles when disturbed. The clicks may serve as warning signals to a regurgitation defense. Most are solitary feeders, but some are gregarious, the Hemileucinae are gregarious when young and have stinging hairs, those of Lonomia containing a poison which may kill a human. A. armida is another example, and are infamous for their large conspicuous masses during the day. The monarch butterfly or simply monarch is a milkweed butterfly in the family Nymphalidae. Other common names depending on region include milkweed, common tiger, wanderer and it may be the most familiar North American butterfly, and is considered an iconic pollinator species. The eastern North American monarch population is notable for its annual southward migration from the northern and central United States and southern Canada to Florida. During the fall migration, monarchs cover thousands of miles, with a corresponding multi-generational return north, the western North American population of monarchs west of the Rocky Mountains often migrates to sites in southern California but has been found in overwintering Mexican sites as well. Monarchs were transported to the International Space Station and were bred there, the name monarch may be in honor of King William III of England. The monarch was described by Carl Linnaeus in his Systema Naturae of 1758. In 1780, Jan Krzysztof Kluk used the monarch as the species for a new genus Danaus. Danaus, a great-grandson of Zeus, was a king in Egypt or Libya, who founded Argos, Plexippus was one of the 50 sons of Aegyptus. In Homeric Greek plexippos means one who urges on horses, i. e. rider or charioteer, Linnaeus divided his large genus Papilio, containing all known butterfly species, into what we would now call subgenera. The Danai festivi formed one of the subgenera, containing colorful species, as opposed to the Danai candidi, Linnaeus wrote, Danaorum Candidorum nomina a filiabus Danai Aegypti, Festivorum a filiis mutuatus sunt. There are three species of butterflies, D. plexippus, described by Linnaeus in 1758, is the species known most commonly as the monarch butterfly of North America. Its range actually extends worldwide and can be found in Hawaii, New Zealand, Spain, D. erippus, the southern monarch, was described by Pieter Cramer in 1775. This species is found in tropical and subtropical latitudes of South America, mainly in Brazil, Paraguay, Bolivia, the South American monarch and the North American monarch may have been one species at one time. Moths comprise a group of insects related to butterflies, belonging to the order Lepidoptera. Most lepidopterans are moths, and there are thought to be approximately 160,000 species of moth, most species of moth are nocturnal, but there are crepuscular and diurnal species. While the butterflies form a group, the moths, comprising the rest of the Lepidoptera. Moth antennae can be varied in appearance, but in particular lack the club end. The divisions are named by this principle, club-antennae or varied-antennae, the modern English word moth comes from Old English moððe from Common Germanic. Moth larvae, or caterpillars, make cocoons from which emerge as fully grown moths with wings. Some moth caterpillars dig holes in the ground, where they live until they are ready to turn into adult moths, moths evolved long before butterflies, fossils having been found that may be 190 million years old. Both types of lepidoptera are thought to have evolved along with flowering plants, mainly because most modern species feed on flowering plants, one of the earliest species thought to be a moth-ancestor is Archaeolepis mane, whose fossil fragments show scaled wings similar to caddisflies in their veining. Some moths, particularly their caterpillars, can be agricultural pests in many parts of the world. Examples include corn borers and bollworms, the caterpillar of the gypsy moth causes severe damage to forests in the northeastern United States, where it is an invasive species. In temperate climates, the codling moth causes extensive damage, especially to fruit farms, in tropical and subtropical climates, the diamondback moth is perhaps the most serious pest of brassicaceous crops. Several moths in the family Tineidae are commonly regarded as pests because their larvae eat fabric such as clothes and they are less likely to eat mixed materials containing some artificial fibers. There are some reports that they may be repelled by the scent of wood from juniper and cedar, by lavender, or by natural oils, however. Naphthalene is considered effective, but there are concerns over its effects on human health. Moth larvae may be killed by freezing the items which they infest for several days at a temperature below −8 °C, despite being notorious for eating clothing, most moth adults do not eat at all. The European hornet is a wasp-waisted Apocritan with a sting, not a Symphytan. 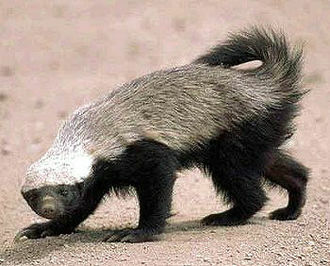 The honey badger's reverse countershading makes it conspicuous, honestly signalling its ability to defend itself through its aggressive temperament, and its sharp teeth and claws.